Today I returned to Pathfinder Park where I had seen a Black Phoebe in juvenal plumage two days ago and thought I might have seen a second Black Phoebe. I refound one Black Phoebe quickly and waited a few minutes-then a second Black Phoebe appeared nearby. Both were in juvenal plumage. I stuck around watching them forage but no parent bird appeared so these have apparently reached independence. 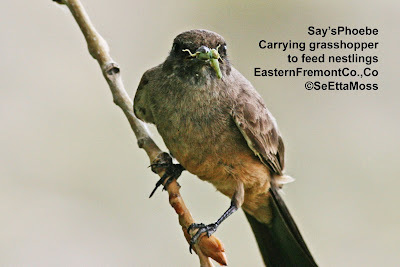 I found this industrious Say's Phoebe carrying food to nestlings under a small bridge in Fremont County, Colo. On two of the trips the phoebe made it carried grasshoppers, a good meal for nestlings. Notice that the grasshopper in the top pic is mostly green. Now see that the grasshopper in the middle pic is kind of tan colored (mostly) but with blue legs. This can be more clearly seen in the bottom pic which is an enlargement of the other. Though hybridization between Eastern and Black Phoebes has been discussed for several years, there has been a lack of documentation. I first observed a Black and an Eastern Phoebe attending a common nest more than 5 years ago but was not able to be there when the birds fledged. 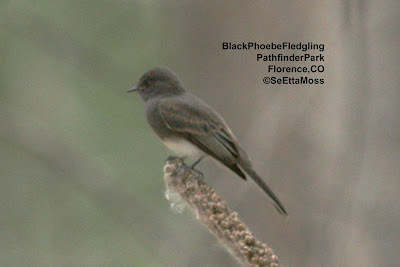 Since then I have seen several phoebes with intermediate plumage between Black and Eastern that I believe to be hybrids including one, with a Black Phoebe male attending her, that had a failed nesting attempt last month. 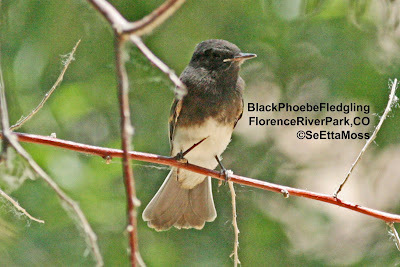 The top pic shows one of 3 Black Phoebe fledglings I found in Florence River Park in Florence, Colo today. This pic clearly shows field marks for juvenal plumage--black head and breast (black back visible in this pic) with white belly and undertail coverts. The bottom pic shows the same fledgling perched next to a parent bird shortly after being fed. This pic is good for showing the difference in tail length between the adult bird on the left and the fledgling on the right as well as the creamy yellow bill flanges and bright orange gape distinctive in fledglings. Both of these pics enlarge pretty good for super close-up views-just double-click on each pic. 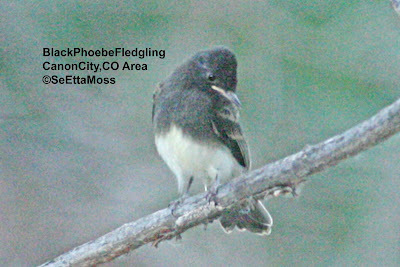 (please note that this replaces part of the post I did late last night when I was tired, a time I am prone to making errors, in which I mistakenly identified the bird in the top pic as one I saw without a parent bird)This is another banner year for Black Phoebes in Fremont County, Colo. 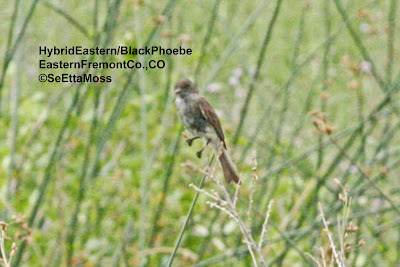 Yesterday I found the Black Phoebe in the top 2 pics in the Canon City area. It and 2 siblings were being fed by a parent bird as they perched in the overhanging branches, a favorite Black Phoebe habitat. Although the bottom pic isn't as sharp as the top pic, I have included it as it shows the features of fledglings in this species including creamy yellow bill flanges, orange gape, short wing and tail feathers.